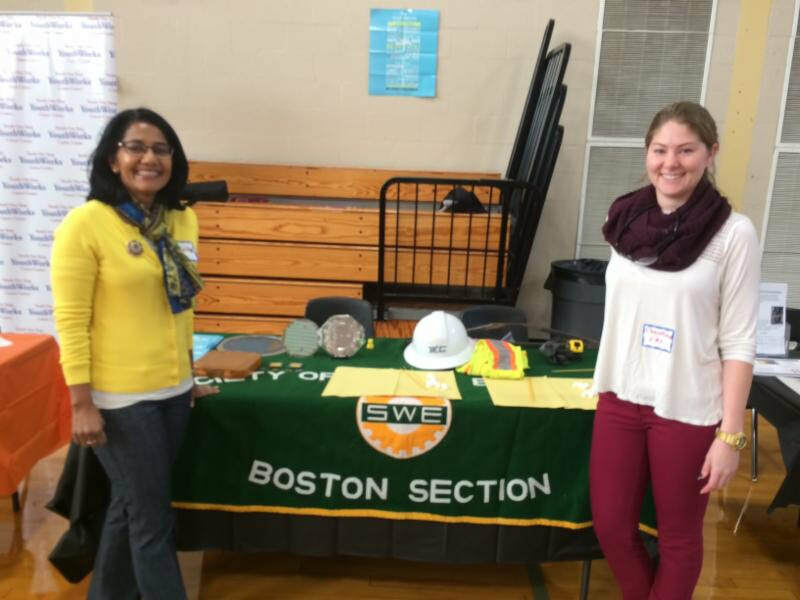 SWE Boston supported the Easton Middle School's Pathways to your Future Career fair on Wednesday October 4th, 2017. The goal of the event was to have 6th, 7th, and 8th grade students learn about different careers and the paths they would need to take for those career. Over 40 different educational organizations and corporations hosted stations for the 900 students that attended the event. SWE Boston members Tulika Hainsworth and Christine Lai had students build towers using marshmallows and spaghetti noodles. The students really got into the competition with several towers that were over 25 inches tall! While the students build their towers, we discussed how engineers shape our everyday world and the variety of engineering careers. Tulika had brought "show and tell" items that highlighted IC manufacturing and power of semiconductors in the electronics we use every day and Christine had items from her work as a structural engineer. It was a great opportunity to foster interest in engineering for these students!